Baking Cookies, Brownies and more! That is the only description you need for this cheesecake. I originally saw this recipe on this blog and put off making it for months since I don’t like lemon. I know, why save a recipe for a flavor you don’t like? It just called my name, that is all I can say. I finally answered (my loving husband had suggested I bake something with lemon for him) and baked this up a few months back and was BLOWN away! It really is one of the best cheesecakes I have ever made or eaten. Let me rephrase, I do not like lemon but I LOVED this cheesecake. I have made it 3 times in the past few months and this was the birthday ‘cake’ of choice my sweet husband chose for me to make for him on his special day last month. He just can’t get enough of it. Don’t be intimidated by the recipe. 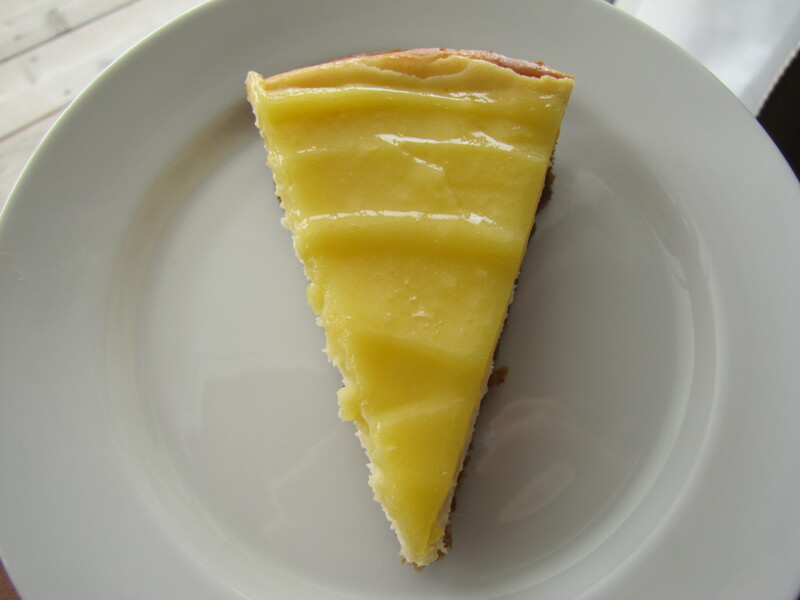 There are 3 components to this recipe but each is very simple: the crust, the filling and the lemon curd topping. All three come together nicely to create a little slice of heaven.The filling of this cheesecake did require just a bit more prep than my usual cheesecake since I had to zest a few lemons but the extra 5 minutes I put in was well rewarded in the end. Like usual this cheesecake is whipped up in a flash (about 10 minutes if everything is room temp) and in the oven in no time. The only down side to baking cheesecakes is that while they are a cinch to whip up and bake; you have to wait at least 10 hours (I prefer 24 hours at least) to eat a slice as it must be chilled after it comes to room temperature. Since I was in the kitchen already and making dishes for the husband to wash, i chose to make the lemon curd while the cheesecake baked and then stored it and the cooled cheesecake in the fridge for 24 hours before topping it with the lemon curd and serving. You could wait and make it the day you want to serve it if you don’t have time to whip it up the same day you bake the cheesecake. I almost didn’t want to cover the top of the cheesecake since after was baked and cooled there were NO cracks at all, just a perfectly smooth top. But, how could I say ‘no’ to that bright and sunny lemon curd? After topping the cooled cheesecake I then chilled it for a few more hours before we cut into this beauty. I find this cheesecake to taste its best 2-3 days after baking it. Something magical happens to cheesecake as it chills in the fridge. The texture of this cheesecake itself is creamy but not too light and not too dense, rich with subtle hints of lemon shining through. The real lemon star is the lemon curd. It is slightly sweet, slightly tangy and just pairs so well with the coolness and creaminess of the cheesecake. These two were made for each other! I chose to use a graham cracker crust because that is all we had and I wouldn’t change a thing. If you are scared of cheesecakes, don’t be. If you don’t like lemon, try this you may surprise yourself. If you need no reason to make this recipe, find one. AFterall Spring is just around the corner and what better way to celebrate than with this! Adjust an oven rack to the lower-middle position and preheat the oven to 325F. In a food processor, process the animal crackers until you have fine crumbs. You should have about 1 cup. Add in the sugar and pulse. In a steady stream, add the butter while pulsing, about 10 1-second pulses. Transfer the crumb mixture to a 9-inch springform pan and press evenly into the bottom. Bake until fragrant and golden brown. The instructions say 15 to 18 minutes, but mine was done at about 12 minutes, so keep an eye on it. Cool on a wire rack to room temperature. When cool, wrap the pan with 2 18-inch square pieces of foil. Set the pan in a roasting pan. Process 1/4 cup of the sugar and the lemon zest in a food processor until the zest is broken down and the sugar turns yellow. Transfer to a small bowl and mix in the rest of the sugar. In a bow of a stand mixer, beat the cream cheese to break it up and soften it slightly, about 5 seconds. With the machine is running, add the sugar mixture in a slow stream; increase the speed to medium and beat until combined, creamy and smooth – about 3 minutes. Scrape down the sides of the bowl as needed. Reduce the speed to medium low and add the eggs, 2 at a time. Beat until incorporated, about 30 seconds. Scrape the bowl before each addition. Add the lemon juice, vanilla and salt and mix to combine. Add the cream and mix until incorporated, about another 5 seconds. Give the bowl a final scrape and pour the mixture into the prepared springform pan. Fill the roasting pan with enough water to make it about halfway up the sides of the pan. Bake until the center jiggles slightly, the sides start to puff, and the surface is no longer shiny, about 55 to 60 minutes. The center should read about 150 degrees F. Turn off the oven and prop the door of the oven open with a potholder or wooden spoon. Allow the cake to cool in the water bath in the oven for about an hour. Transfer the springform pan to a wire rack and run a small paring knife around the edges of the pan to loosen the cake. Let it sit to room temperature for 2 hours. 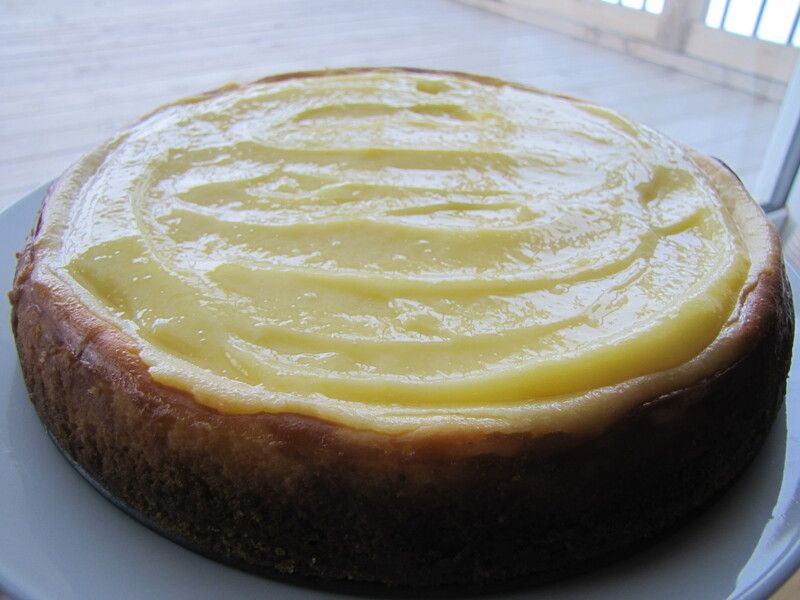 While the cheesecake is baking, heat the lemon juice in a small non-reactive pan on medium heat until hot, but not boiling. Whisk the eggs in a small bowl, then gradually whisk in the sugar. Whisking constantly, slowly pour the hot lemon juice into the egg/sugar mixture, then return the mixture to the saucepan and continue to heat over medium heat, stirring constantly until the mixture reaches 170 F and is thick enough to cling to the spoon, about 3 minutes. Immediately remove the pan from the heat and add in the cold butter and mix until incorporated. Stir in the cream, vanilla and salt, then pour through a strainer into a small nonreactive bowl. Cover the surface of the curd directly with plastic wrap and refrigerate until needed. 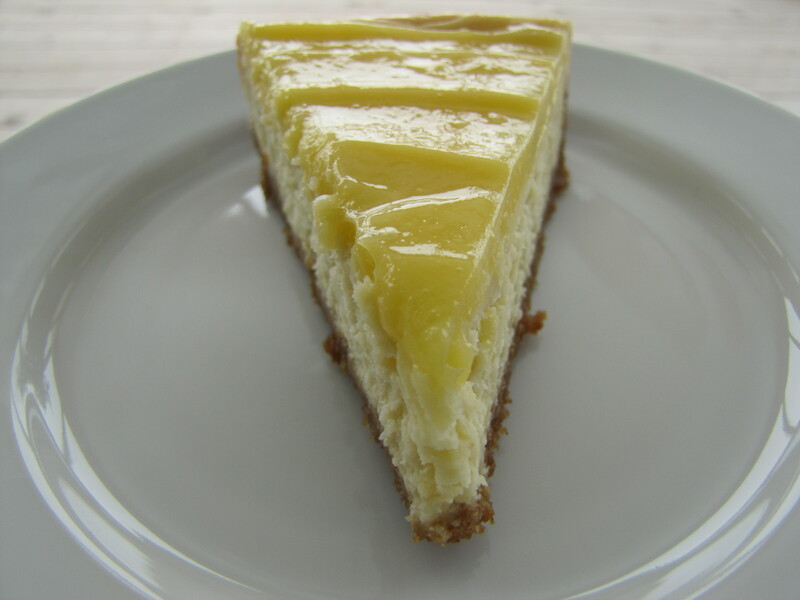 This entry was posted in Cheesecake, Desserts, Lemon, Rated a 9.5 by bakingblonde. Bookmark the permalink. Love this! I bake cheesecakes for a local restaurant, and you’re the only one, (besides myself) that swears by the ‘wrapping the pan in foil’. I double wrap mine, and don’t prop the door open, just turn the oven off, and let it sit in the oven for an hour. When I first started baking my cheesecakes, I’d never baked one before (shhh!) and searche all over the www for techniques. The best, (most fun) so far has been a Creamsicle Cheesecake, next one on the list: S’More Cheesecake! yummmmmm! this sounds like my kind of cheesecake. how do you cut yours and keep it pretty? wet knife? thanks. your oreo brownies are a family fav. This looks sensational! I used to hate lemon, now I love it especially in desserts..still don’t like lemon drops though…My husband also likes lemony or citrusy desserts. I will put this on my list! I LOVE lemon desserts, and considering how much you liked this one, can’t wait to make it. I made this cheesecake too (I subscribe to http://www.cooksillustrated.com and found it there) and I second your opinion… It is AMAZiNG!!!!!!!!! I made this lemon cheesecake for my sisters Christmas party, and it was the talk of the party. “DELICIOUS” I will make this for many years to come. Thank you!